Today, if you visit Piazza Vittorio in Rome, you can see throught the railing, an exceptional building: what remains of the unique testimony of alchemical crafting in 17th century: the Alchemical door. 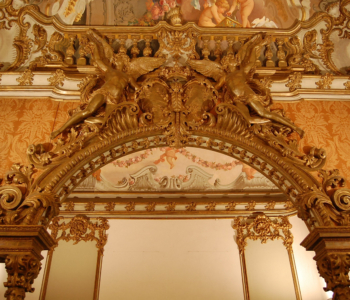 It’s a marble door with jewish, latin and egyptian incriptions, builted between 1678 and 1680 by Massimiliano Palombara marquis of Pietraforte (1614–1680) in his residence, the Palombara villa, located on the Esquilino hill as a secondary entrance. Later, in 1873, the Villa went throught a series of changes and the door was moved from the original Villa to the position where now is, the other doors were destroyed. Another alteration happened in 1888 when two deformed creatures, with short, stout legs and a grotesque bearded face, that represent a real Egyptian divinity or semi-divinity called Bes, were put on both sides of the door. 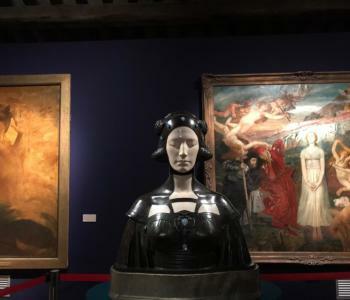 Originally the two statues did not belong to Villa Palombara. They were found somewhere near the Quirinal Hill, where in ancient times stood a large temple dedicated to the Egyptian gods Isis and Serapis. The Marquis Palombara was a poet, rosicrucian and alchemist, very close to the roman court of queen Christina of Sweden, attented also by Pietro Antonio Bandiera the esotericists Giuseppe Francesco Borri and Athanasius Kircher. The Queen herself was strange: after she converted to Catholicism, abdicated the throne of Sweden and spent much of the rest of his life exiled in Rome from 1655 until her death in 1689. 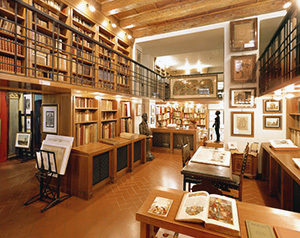 It was rumored she had an alchemical laboratory and that, the same Porta Alchemica, was built in 1680 as a celebration of a successful alchemical transmutation occurred in her laboratory. 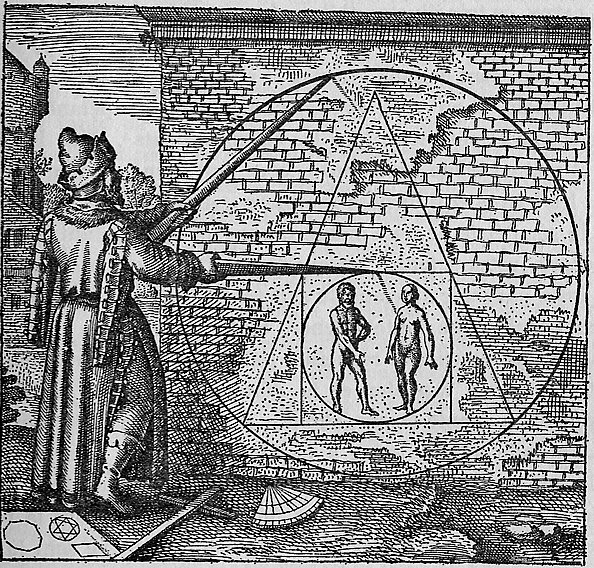 The alchemical door (Porta Alchemica) can be considered as a summa of all alchemical studies of that period. 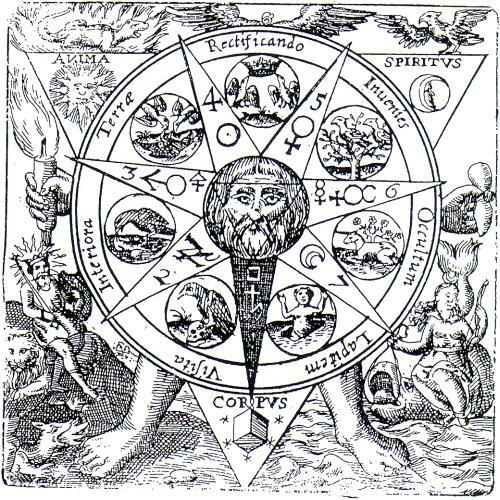 Its shape can be compared to the 21st emblem of the famous alchemical text Atalanta Fugiens written in 1617 by Michael Maier, a German physician, alchemist and counsellor to Rudolf II of Habsburg. 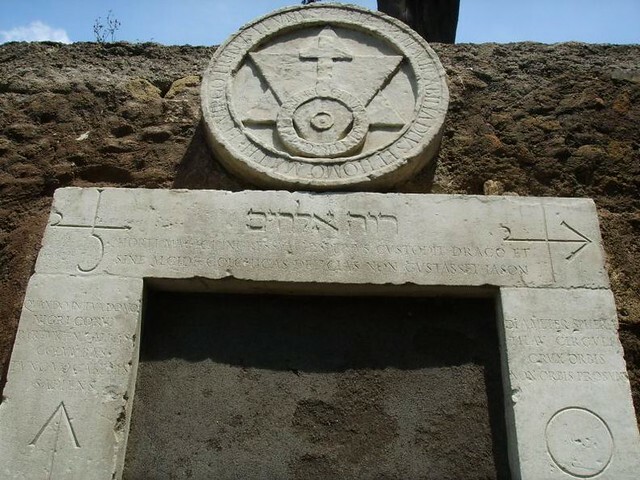 The pediment of Porta Alchemica is composed by a kind of Solomon seal (the two triangles overlapped) inscribed in an circle with a Latin inscription, on the top of which there is a cross, both inside a outer circle. The inner circle looks like an eye (oculus) that resembles the Eye of Providence, the same symbol you can see on american dollars, invented by John Greaves and first appeared in his book Pyramidographia, in 1646, written after a trip to Egypt. Anyway, the entire symbol of the pediment appears on the page title of the alchemical book Aureum Saeculum Redivivum of Henricus Madatanus aka Adrian von Mynsicht (1603–1638). 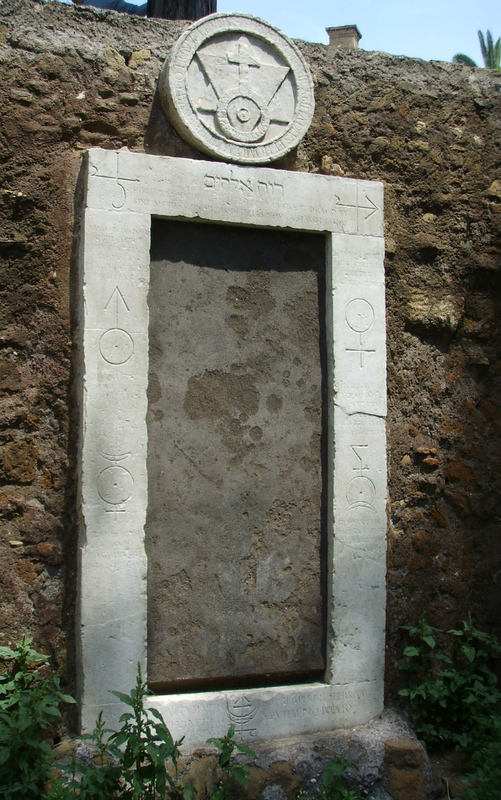 Around the inner circle there is the inscription: “CENTRUM IN TRIGONO CENTRI” (The center is in the triangle of the center) and in the outer “TRIA SUNT MIRABILIA DEUS ET HOMO MATER ET VIRGO TRINUS ET UNUS” (There are three marvels: God and man, mother and virgin, triune and one). The lower part of the emblem, “centrum in trigono centri”, was reproduced in the work that circulated in the Gold- und Rosencreutz Orden, the Geheime Figuren der Rosencreutzer (Altona, 1785–88). What was this door for? To understand the real use of the door, we must consider its original location, that is, the garden of the Marquis Palombara’s Villa. It was a part of a wider plan of garden design, wanted by the marquis himself as he said in his will, in order to built a locus amoenus. The garden of the Villa had to be an ideal place where men got in touch with Nature and this was very normal in villas if we know that garden, as a place of peace and meditation, was very common during Renaissance and then on, until XVII century. 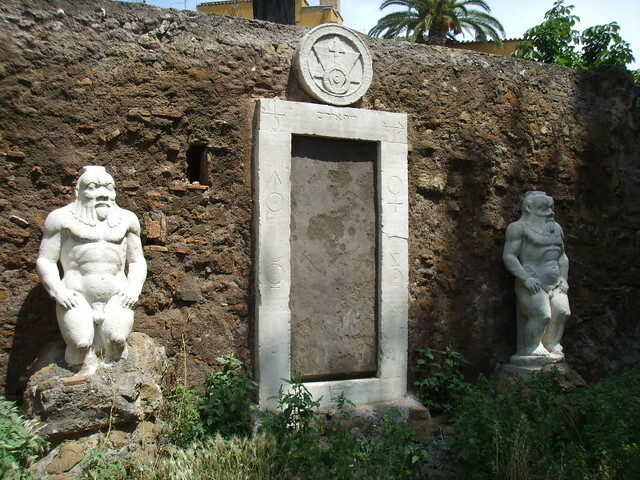 On the architrave is written: HORTI MAGICI INGRESSUM HESPERIUS CUSTODIT DRACO ET SINE ALCIDE COLCHICAS DELICIAS NON GUSTASSET IASON that means “A dragon guards the entrance of the magic garden of the Hesperides, and, without Hercules, Jason would not have tasted the delights of Colchis”. The Alchemist is an allegory of the erudite, the garden was the place of meditation and the door a symbol of passage from ignorance to wisdom. I think that all the other explanations, involving Rosicrucianism, black magic, Illuminati society and other septs has to be forgotten. These septs just borrowed alchemical signs for their symbolism giving them new and different meanings. 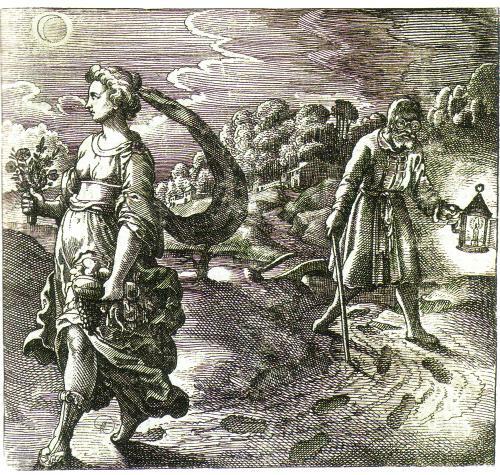 The symbolism implied in the Alchemical Door is so intricate that it’s easy to misunderstand. The door is just one of the rare visible testimony of XVII century alchemy studies and the only way we can talk about alchemy is in art, as Marcel Duchamp knew it well. Today the door is quite neglected and it’s not possible to visit it. You just can catch a glimpse of the door throught the railing of Piazza Emanuele Vittorio II. Such a pity. sources: “Arte e alchimia” by Maurizio Calvesi (here), visit also this page. pictures from wikipedia. Solomon seal; Aureum Saeculum Redivivum by Henricus Madatanus aka A. von Mynsicht and the Eye of Providence in american dollars. 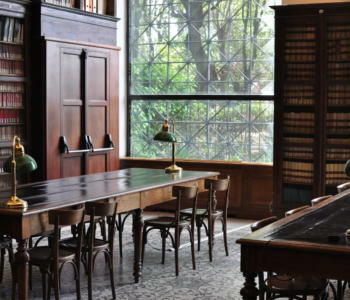 Un luogo eccezionale. Il fatto che sia letteralmente immerso nel traffico e nel caos più totale, in stato di semi abbandono e dimenticato dalla gran parte della popolazione, parla da solo. Un segno dei tempi. Ma quante ne sai Silvia.. E’ sempre un piacere, Brava. ….Volevo dire Lisa. Scusa! Comunque brava.